7 Oppen Lane is a 3,000 square foot single family home with three bedrooms and four bathrooms. It was being marketed for $2.395M and sold for $2.1M. Oppen Lane is in the West End near the Moors. The house has gorgeous views out to Herring Cove Beach and beyond. MLS REMARKS: Open the beautiful Sea Glass-colored front door to this spectacularly renovated Contemporary Cape and be blown away by the views, inside and out. From the open two-story foyer your eyes rise to the sun splashed second floor mezzanine with cathedral ceilings and twin skylights. The Post and Beam Construction allows for huge open spaces and soaring ceilings, all designed for easy entertaining and beautiful light-filled living. New Andersen Patio Doors and matching height windows create a wall of glass across the view side of both the first and second floors of the home and lead to spacious new decks, with a screened-in section off the kitchen for pest-free dining. 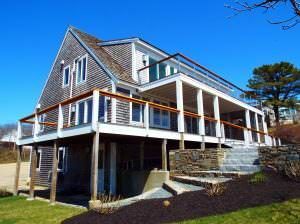 Gorgeous views to the Moors and the Atlantic from both the first and second levels of this home will captivate you. See all available proerties for saleat Beachfront-Realty.com.